We have been waiting for Ella's Karyotype blood work to come back from the lab for 5 weeks now. The Karyotype blood work is where they photograph the chromosomes and cells in the blood and count them. Basically, it is the way to confirm Trisomy 21 (Down syndrome). We received the preliminary results from the blood work on the Friday after she was born, but we have been waiting on the "written proof" since then. We wouldn't be so anxious to receive the results (being we already know that she has Trisomy 21) but without the results back we can't move forward with her therapies and the state application for aid. So, I have been waiting and waiting to get it back. Today I had finally had enough waiting and after some google searches realized it shouldn't have taken this long to get the results and I started calling around to see how we could speed it up. I reached a nice woman in medical records at the hospital where Ella was born and she told me to come in and get the results. INTERPRETATION: Female chromosome complement with an extra copy of chromosome 21 (trisomy 21). Trisomy 21 is consistant with the clinical findings of Down syndrome. I read this and right then and there, in the parking lot of Fry's (where I was stopping to buy the oh so important chicken nuggets for dinner) I started to cry. I don't know why, but holding this piece of paper, seeing the words on it, made me sad and angry and almost sick to my stomach. I know Ella has Down syndrome, I didn't need this paper to confirm it, but seeing it in writing by a genetic doctor seemed to make it so much more real. My little girl got her first ever progress report and it alreay has her labeled. I wanted to take the paper and throw it away. Soooo.. How did I get myself from crying in the car to buying chicken nuggets? By calling Erin. By telling her I finally got the results. By telling her it almost made me cry (I didn't want to admit to actually crying). By hearing her say. "OK, so you have the results. You have known she has Down syndrom for 5 weeks, what's the big deal with a silly paper saying it?" Right. What's the big deal with the paper? I couldn't answer her. I just agreed and then, right there between waffles and whipped cream, I stopped feeling sad and angry and remembered that just 1 hour ago there was no big deal and I thanked her and found my chicken nuggets and came home to my boys and life went on. I needed to remember that no one, no doctor, no genetic counselor, no one is going to label my baby as anything. Not me, not a doctor, not a teacher, no one. She might be slower to talk or read or walk, but that doesn't make her a simple diagnosis on a piece of paper. That makes her - her. I know this piece of paper is important for the state and her doctors but to me and Erin and everyone else, that piece of paper is so unimportant in the whole realm of Ella's life. 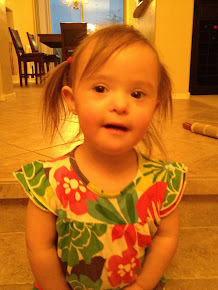 Yes, she has Down syndrome, yes, it was confirmed by a dr. but that test, that paper will never define her. NEVER. I am off to bed. While I was very happy spring break was over, I forgot that meant I have to wake up early and get kids fed and off to school. No fun and not easy to do when you spent the 4 AM feeding watching 16 and Pregannt and crying your eyes out.